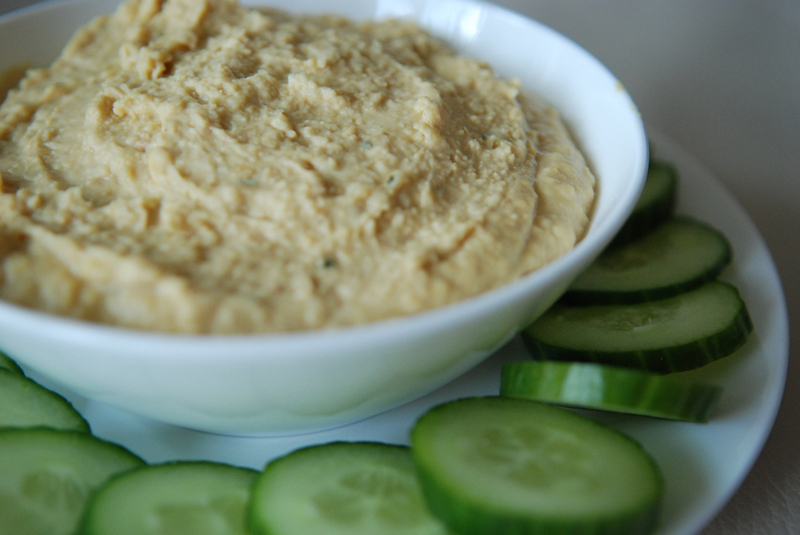 Hummus is a popular Middle Eastern chickpea spread. I know everyone has their own favourite hummus recipe and this is mine, which is probably not that authentic but still super tasty. 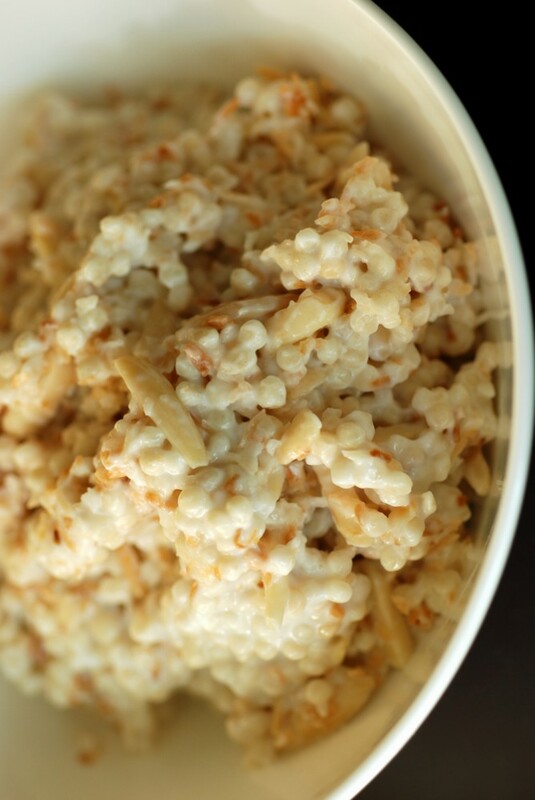 I initially gravitated to this recipe during my university days as it was a quick and easy recipe (just whiz everything in a blender and enjoy!) and comparatively cheap and healthy. I didn’t have tahini (a common sesame paste used in hummus), though, but peanut butter was easy to find. Now that I have tahini, I still prefer this variation as it is smooth with a subtle peanut taste, but not too spicy. It is perfect to use as a dip for chopped veggies, crackers, pita bread, or as a spread on a sandwich with tomatoes, lettuce, sprouts, red peppers, etc. Right now in Toronto, we are experiencing our first real snow storm of the year. We finally have a few centimeters of snow on the ground, which contrasts to our nearly bare ground throughout the majority of the winter. I had to venture outside the city to find snow, especially since one of my new winter activities is snowshoeing. I remember walking around clumsily in snowshoes when I was in elementary school. We had wooden ones, and more commonly plastic snowshoes that looked identical to the wooden ones. I found it difficult to manoeuvre the snowshoes which substantially widened my gait and there wasn’t much traction on the bottom, either. Fast forward a decade or two, and I join my friends at their cottage and we decide to go snowshoeing. ‘These snowshoes are more modern,’ they explain, assuring me it isn’t as daunting as I recall. The shape has changed (especially for women’s styles), they are lighter with great grip. It took a bit of use to walking up and down hills initially, but afterwards there was no stopping us. This was fun! Around an hour north of Toronto, there is a small town called Horseshoe Valley. Because it is in the valley, it receives more snow than Toronto and the valley ridges provide ample trails with some altitude. I have been there twice so far this winter, and both times Horseshoe has not been less than stellar. An early morning snowshoe following fresh snow that fell overnight, or the above freezing temperature with ample sticky snow (great grip for the snowshoes). 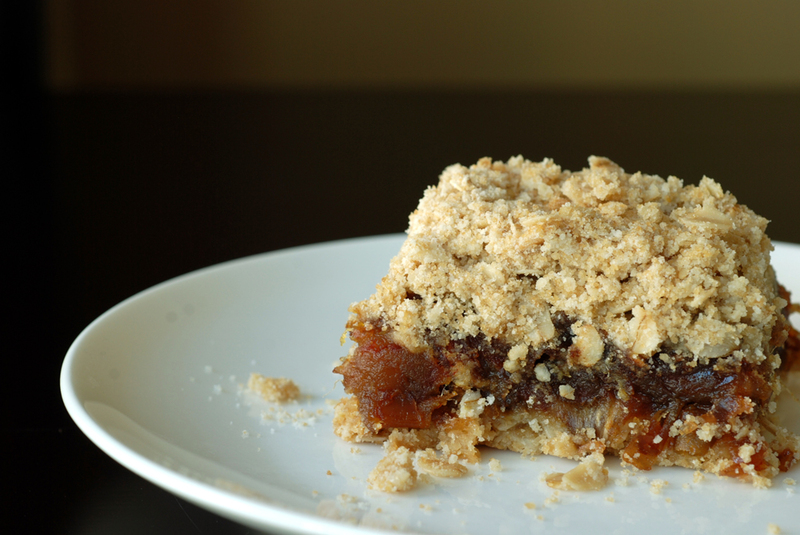 After all this exercise, there is nothing better than to huddle back together in the cottage, sipping on some tea and munching on some date squares. 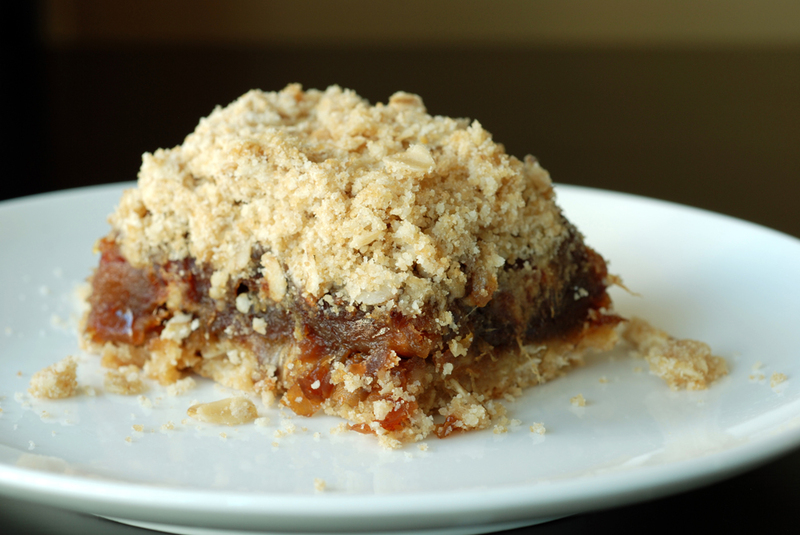 This date square recipe is courtesy of my mom, who is a fabulous cook. The original recipe calls for 250g dried dates, but I like a meaty filling, so you can definitely add more without increasing the rest of the filling. I added cranberries to this batch instead of currants (the more typical ingredient) but found it a bit too sweet for me (my snowshoeing companions had no complaints, though!). The currants have a slightly bitter taste that works well with the natural sweetness from the dates. I wonder whether fresh cranberries could have helped tame the sweetness – a project for next time! The squares can be eaten warm or cold, but I prefer them warm with a big glass of milk. Enjoy! 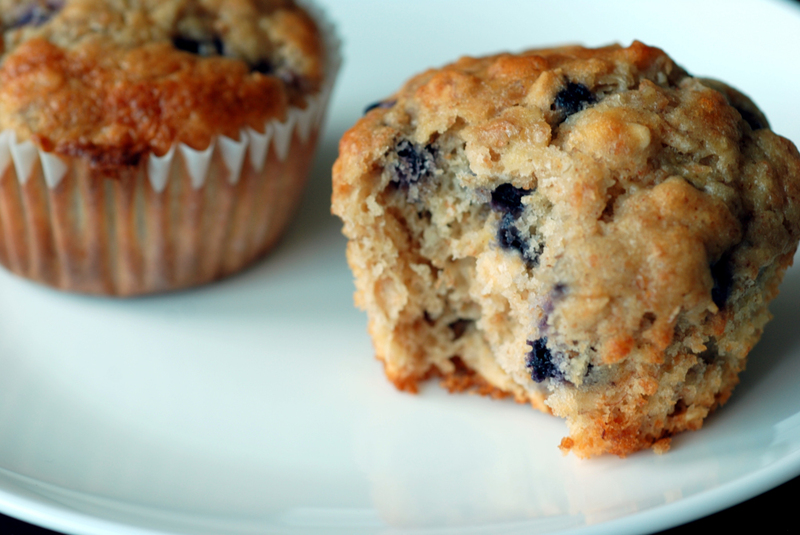 This is the finale of my muffin trifecta: Wild Blueberry Banana Oatmeal Muffins (to add to Spiced Yogurt Muffins and Chocolate Zucchini Cupcakes). A combination of all great ingredients, spurred by a few lonely bananas that made it to the black, yet super sweet stage on my kitchen counter. 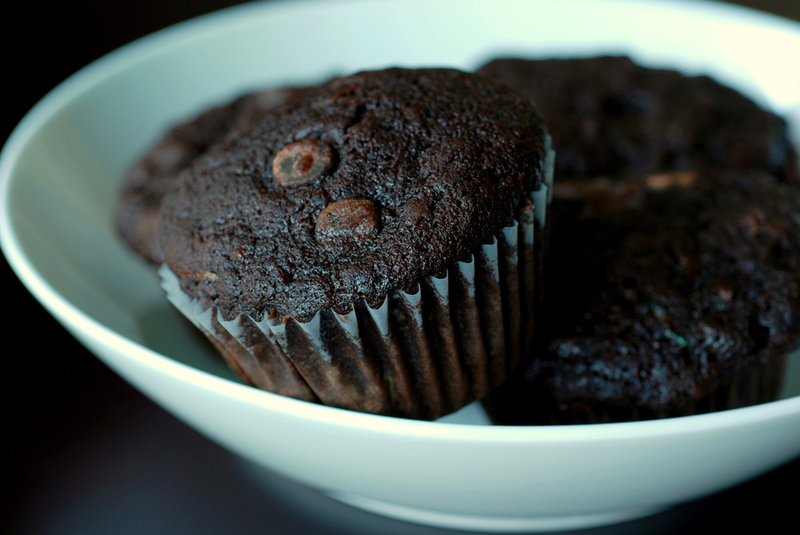 While this muffin was incredibly tasty and filled with healthy ingredients, I don’t think I will be making muffins again anytime soon…. so many muffins from one batch lasting me a week or two, I think I am all muffined out for a while. This recipe was adapted from The Good Mood Food Blog and is my submission for this week’s Weekend Herb Blogging, hosted by Dhanggit at Dhanggit’s Kitchen. 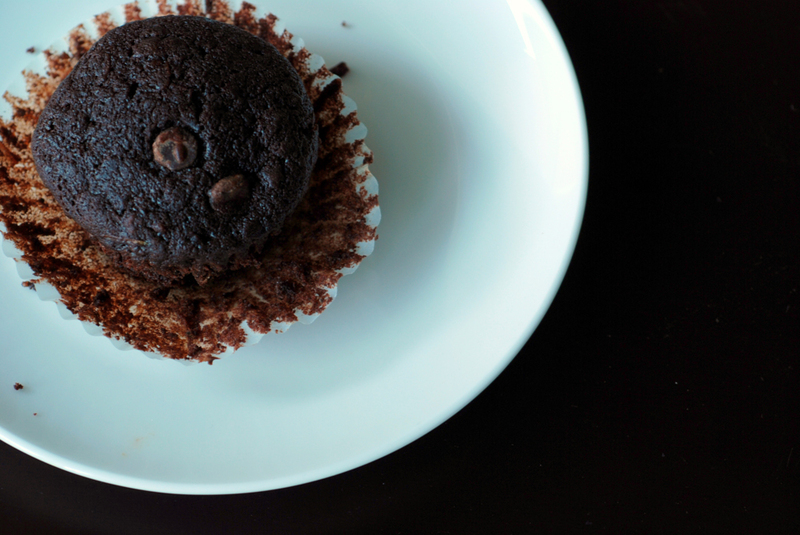 Continuing with our muffin/cupcake theme, here a completely unhealthy (don’t let the zucchini fool you) but wonderfully decadent muffin (or is it a cupcake? ), filled with chocolate (1 cup of cocoa plus chocolate chips! ), made deliciously moist with zucchini with a hint of spice with cinnamon and allspice. I used half mint chocolate chip which added another interesting layer of complexity. But what makes something a muffin and something a cupcake? I always figured cupcakes were more cake-like, more airy, less substantial, more dessert, whereas muffins were a bit more heartier. Basically, I had a general idea but not entirely sure… so I did a bit of research. 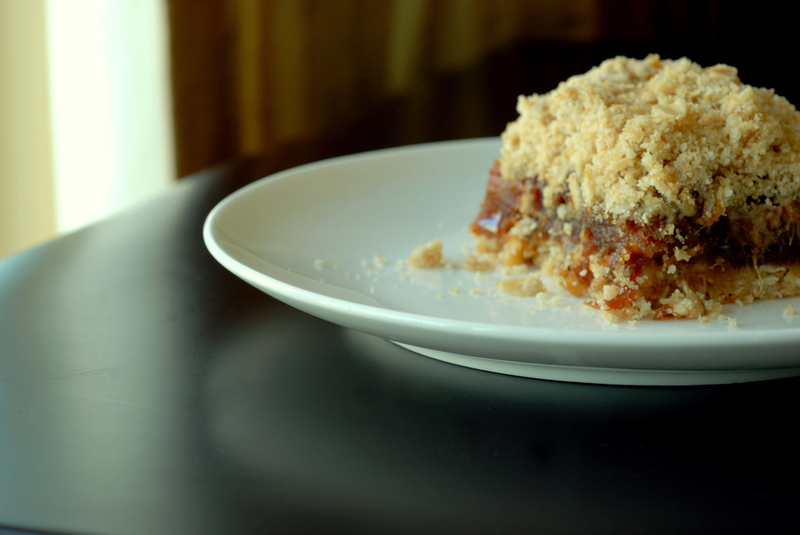 This recipe is from Rebar: Modern Food Cookbook by Audrey Alsterburg & Wanda Urbanowicz and also found at 101 cookbooks. It is my submission for this week’s Weekend Herb Blogging, hosted by Cinzia at Cindystar. This will be the beginning of my muffin mania. I have a love/hate relationship with muffins, as it can take a while to munch through a whole batch of muffins and sometimes I wonder how healthy they really are. So I went on a search for a healthier muffin. I found these Spiced Yogurt Muffins, which I adapted from the November 2008 issue of Food & Wine (and also posted here, here and here). 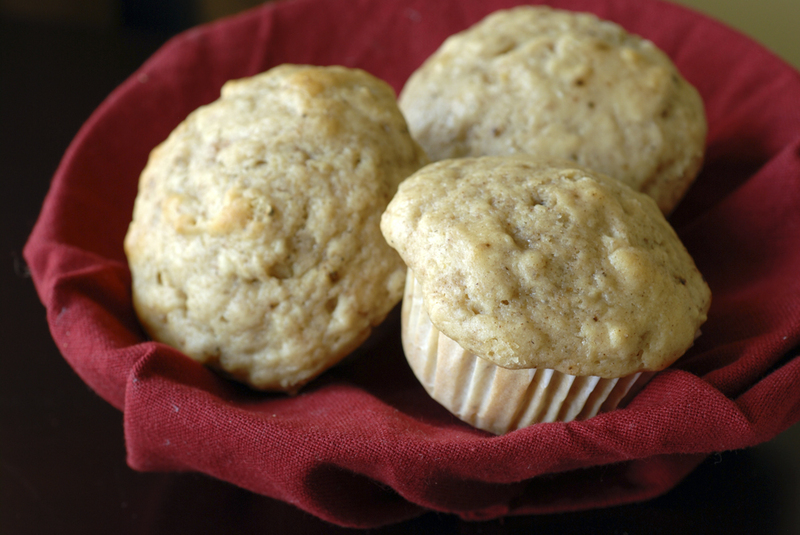 These spiced yogurt muffins were incredible straight from the oven. They were moist, light and fluffy with delicious spices infused into the batter. I recently won fresh and whole Penzey spices from Aimee at Sugared Ellipses and found it made a real difference, especially when the main star of the muffin are the spices. The muffins were a bit sticky to the muffin wrapper while they were warm from the oven (nothing a spoon can’t fix), but the next day they fell apart more easily. 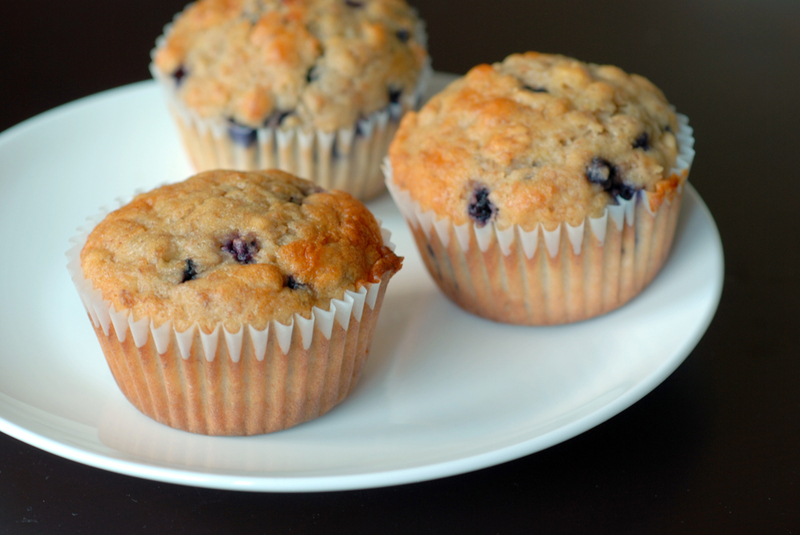 Muffins are best kept at room temperature for a few days, else frozen after they were made. Putting them in the refrigerator makes them dry. 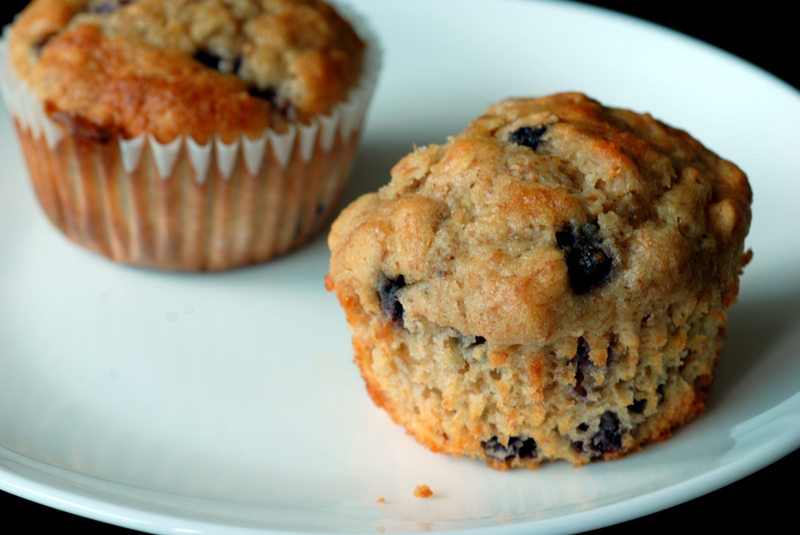 With only 140 calories (and 3 g fat) per muffin, I think they also qualify as healthy (unlike Starbuck’s Sunrise muffin that is almost 600 calories each!). 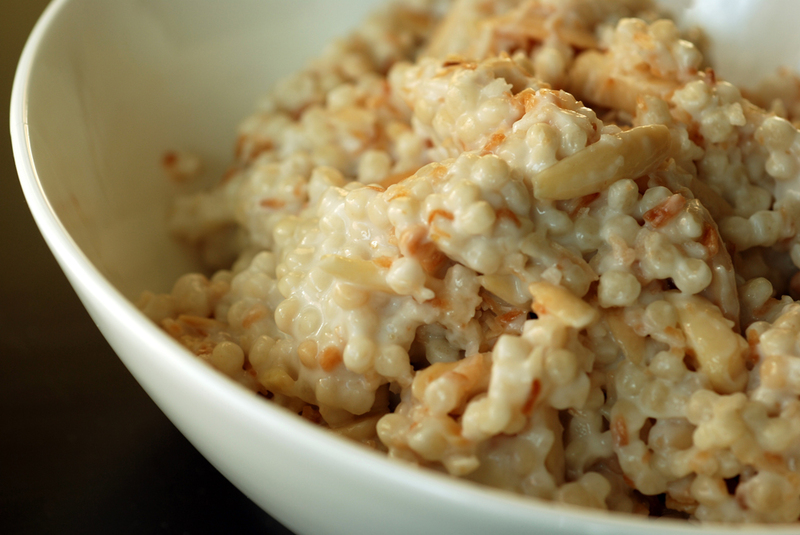 Here is an interesting twist for breakfast: a bowlful of pearl (Israeli) couscous with coconut, almond and honey. I found it difficult to find Israeli couscous, but eventually found it at Loblaws in a Jewish neighbourhood. I am not really sure how it is related to the traditional, smaller couscous, but let me state this: it is NOT a grain. Many people erroneously believe couscous holds healthy properties, but it is merely pasta . Israeli couscous is a wheat-based pasta (with wholewheat/wholemeal varieties too), similar to orzo, and reminds me of tapioca pearls. They grow in to large plump balls of pasta-goodness. Toasting Israeli couscous gives it a nice nutty taste, which is perfect when it is paired with coconut and almonds with a bit of sweetness from honey. I based the recipe from A Sweet Spoonful and while it doesn’t look like it feeds four, it does as it is quite heavy with the coconut milk. 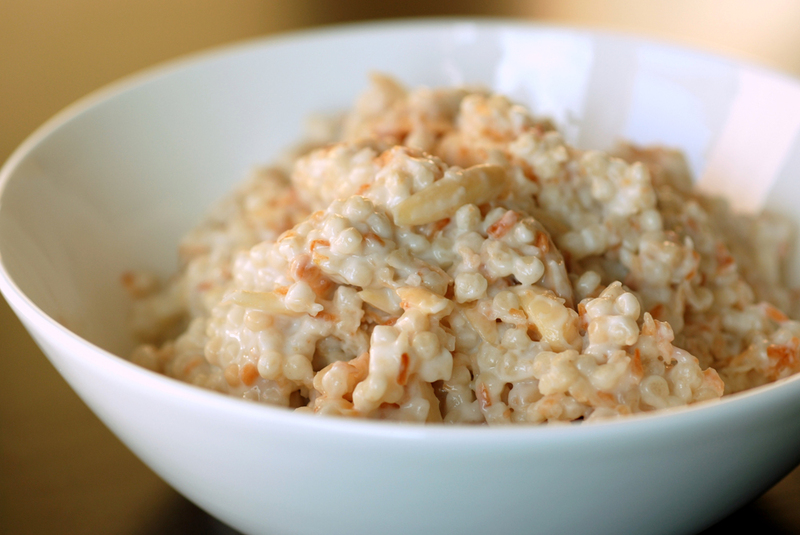 Like most breakfast dishes, it is best the day it is made. With coconut as a prime flavour sensation, this is my submission for this week’s Weekend Herb Blogging, hosted by Simona from Briciole.